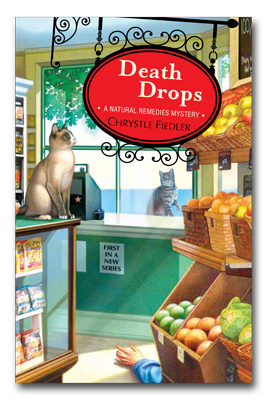 I was immediately intrigued when I first heard about Death Drops: A Natural Remedies Mystery by Chrystle Fiedler. If the two cats on the cover hadn’t caught my eye, the subtitle surely would have. 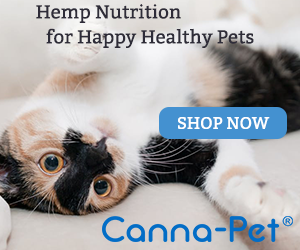 A mystery featuring a naturopathic doctor, flower essences, and a dog and two cats, penned by a writer specializing in alternative health topics? I knew this one had to be right up my alley. Death Drops’ protagonist Dr. Willow McQuade gives up her practice in Los Angeles to run her beloved Aunt Claire’s Nature’s Way Market and Cafe on Long Island after her aunt is found murdered. Next to her aunt’s body lies a bottle of flower essences intended to provide stress relief. Did they contain the poison that killed her aunt? The police’s investigation focuses on Willow, who had motive since she inherited her aunt’s business and the rights to an anti-aging cream formula that her aunt had been working on. Willow sets about to prove her innocence and find the real killer with the help of a retired police officer. The plot heats up as they find a slew of possible suspects. When several acts of sabotage against the store put Willow and her friends in real danger, Willow knows she is getting closer to solving the murder- but will she find the killer before someone else dies? This is an engaging cozy mystery with an immensely likeable cast of characters. The two cats and the dog play a only peripheral role, but the author’s love for animals comes through in the way she portrays them. I loved the focus on natural remedies throughout this book, even as part of the plot line. Additionally, each chapter is prefaced with a brief and entertaining explanation about natural remedies for anything from the common cold to arthritis. I thoroughly enjoyed this debut, and I’m looking forward to the next book in the series. Chrystle Fiedler loves natural remedies. She has written about them for Natural Health, Better Homes & Gardens, Remedy and Woman’s Day. Her books focus on natural remedies too, and include The Complete Idiot’s Guide to Natural Remedies, Beat Sugar Addiction Now! and the Country Almanac of Home Remedies. For more information, please visit Chrystle Fiedler’s website. Invalid mfunc tag syntax. The correct format is: <!-- W3TC_DYNAMIC_SECURITY mfunc PHP code --><!-- /mfunc W3TC_DYNAMIC_SECURITY --> or <!-- W3TC_DYNAMIC_SECURITY mfunc -->PHP code<!-- /mfunc W3TC_DYNAMIC_SECURITY -->. Thanks for stopping by, Chrystle. I can’t wait to read the sequel – great title! What an interesting combination of plot elements! Isn’t it, Bernadette? I’m so glad I found this one!